Panton Junior Chair (mspantonjunior) at Pure Design Kids / Seating / Chairs ::: Kids' Toys, Furniture and More at Pure Design Kids! 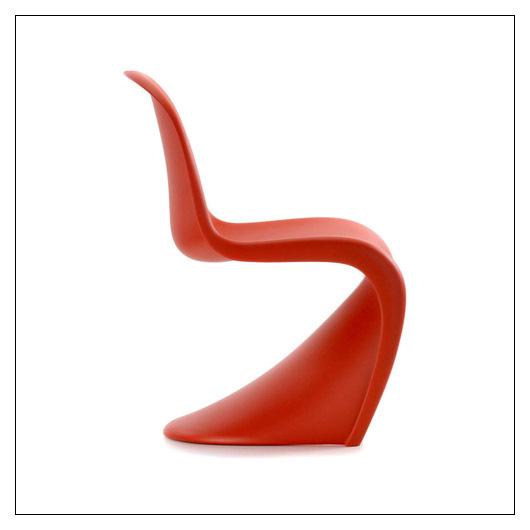 The Panton Chair has always been a favorite of children. They not only like its bright, cheerful colors and smooth curves, but the fact that it is as much fun to play with as it is to sit on! Looks like one big scoop of a slide. Soon after its introduction, Verner Panton began to consider the idea of producing a child-size version of the chair together with Vitra. Thank you, Verner! Kids love it! What was financially unfeasible over 35 years ago is now possible: Vitra introduces the Panton Junior, whose production is based on the original plans of Verner Panton. Identical to the adult-sized regular model with regard to material and shape, the Panton Junior is approximately 25 percent smaller and available in six different colors. This makes it an ideal chair for children in pre-school and primary grades. ** Fit Tip: This is a kid-size chair!